The Le Morne Brabant Peninsula is located on the south-west corner of Island. The main attraction of this area is a single standing basaltic rock with a summit of 556 meters above sea level. The peninsula is surrounded by one of the largest beautiful lagoon. The Le Morne village has about 1700 inhabitants whose livelihoods mainly depend on the tourism and fishing. The lagoon has been used as a traditional fishing ground by the people living in the area since many generations. Almost 150 fishermen live in the Le Morne village. Le Morne is one of the poorest villages in Mauritius. Le Morne Brabant was founded by the former slaves. In the18th and early 19th century hundred of slaves used Le Morne Brabant as a place to hide because of the fear of their holders. After the abolishment of slavery in Mauritius, an expedition made their way to the mountain on 1st February 1835 to tell the slaves that they are free now. However, the slaves misunderstood them and jumped off the mountain to their deaths, so that they would not be enslaved again. Since then, this day is celebrated as Annual Commemoration of the Abolition of Slavery by Mauritian Creoles. Le Morne Peninsula beach offers lovely white sand and is ideal for swimming. Being a windy beach, it is also very popular with the surfing and paragliding enthusiasts. You can also go for snorkeling and under-water walking. Le Morne also has a beautiful park named Domaine Des Grands Bois, hidden in the hills and spreading over 2,000 acres. The park has wild animals such as stags, deer, monkeys and many more along with some rare and exotic birds like the Mauritian Pink Pigeon and the Kestrel. For shopping lovers this place is perfect where you can get branded products for really good price. You can shop for spices, woven articles, bags, hats and lots more. In the shops you can also get local rum, stamps, arts and crafts or jeweler diamonds and good quality watches. 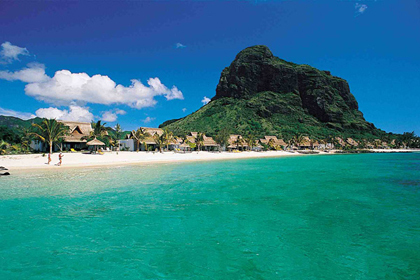 Most of Le Morne Peninsula is taken up by two five-star resorts, situated at the foot of Le Morne Mountain. Apart from 4 and 5 star hotels on Le Morne Peninsula there are some beautiful private villas on the foot of Le Morne Brabant Mountain which offers breathtaking views over the Indian Ocean. At Le Morne Peninsula you have great choice of restaurants like Le blue Marline were you can have your breakfast and lunch serving European, Mauritian and seafood meals with a spectacular ocean view in the background making up for a perfect ambience. La Palma is very popular restaurant which blends to perfection the flavor of Italian food in tropical atmosphere. Wow, this resort seems amazing! We’re in the beginning stages of planning our next vacation and have been doing a lot of research. One of our favorite luxury five star resorts is Sea Island Resort in Georgia – seems like a destination in itself!